Del Ure and his team came into this match in good spirits having dispatched of a poor Huntly side the week prior to reach the second round of The Scottish Cup. However, they wouldn’t have it all their own way against a Gala side fresh off their own cup win. 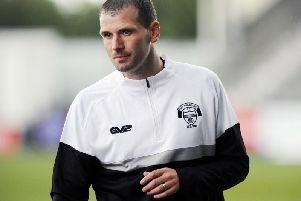 Del Ure said in midweek that he wanted to see his side apply their cup form to the league, however he was sorely let down as Gala started the brighter with Hibernian loanee Ruari Paton shooting straight at Jamie Barclay after being sent clean through. Shire seemed unable to recapture the intensity that saw them ease past Huntly last week, with a combination of misplaced passes and poor first touches stifling their efforts in attack. They were eventually punished for their passiveness as the impressive Paton had the simple job of running the ball over the line uncontested after Jamie Barclay had parried a shot back into the danger area. Shire had Barclay to thank for not falling further behind as he denied the Gala attack once more after a poorly judged Bitanga back pass brought up a glorious chance for the visitors to extend their lead only to be denied by the onrushing Shire keeper. Ure sought to change things at the break with the introduction of Simon White and Steven Brisbane. The changes almost paid dividends early as Shire almost levelled the scoring after Rodgers curled narrowly wide after being teed up by strike partner Ross Allum. Having been unable to attack with any fluency in the first half, Shire started to find their feet and could feel slightly aggrieved after the reinvigorated Rodgers went down on the very edge of the penalty box only for the referee to signal for a freekick. The decision became even more controversial when Gala doubled their lead after a dangerous cut-back forced Graeme MacGregor to turn the ball into his own net and give the visitors much needed breathing space. MacGregor’s unfortunate contribution proved the killer, as Shire’s fate was confirmed shortly after when Ricky Miller rose unchallenged at a corner to seal an emphatic win for his side. Gala leapfrog Shire into 10 th while Shire’s league struggles see them slip to a lowly 11 th .